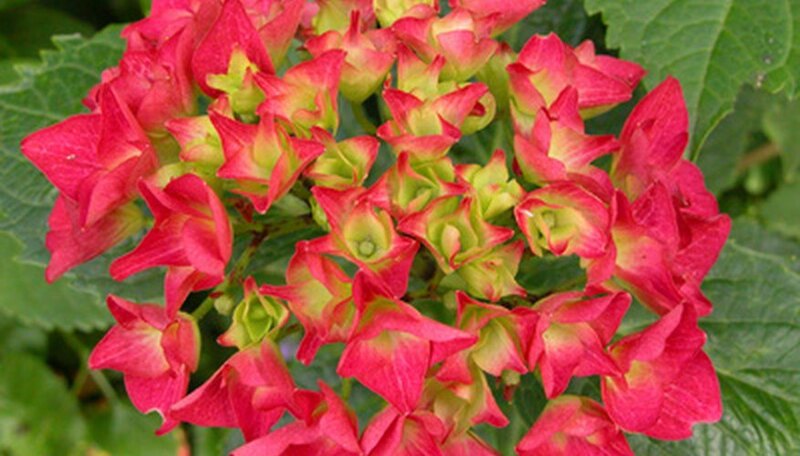 Hyrdrangeas are popular landscaping plants that produce large and showy flower heads. These shrubs grow 5 to 22 feet tall depending on the cultivar. There are several shrubs that are similar to the hydrangea, producing large showy blooms on similarly sized shrubs. For variety, gardeners may choose to plant other shrubs that mirror the hydrangea but offer additional colors as well as different textures and shapes. Viburnum opulus, also know as the snowball bush, resembles a hydrangea plant in that it produces a large globe-like blossom in mid-spring and summer. According to the American Horticultural Society’s "Great Plant Guide," snowball bushes provide bright autumn color and red berries in the fall. They grow approximately 15 feet tall and 12 feet wide at maturity. The snowball blossom is white and similar in size and shape. 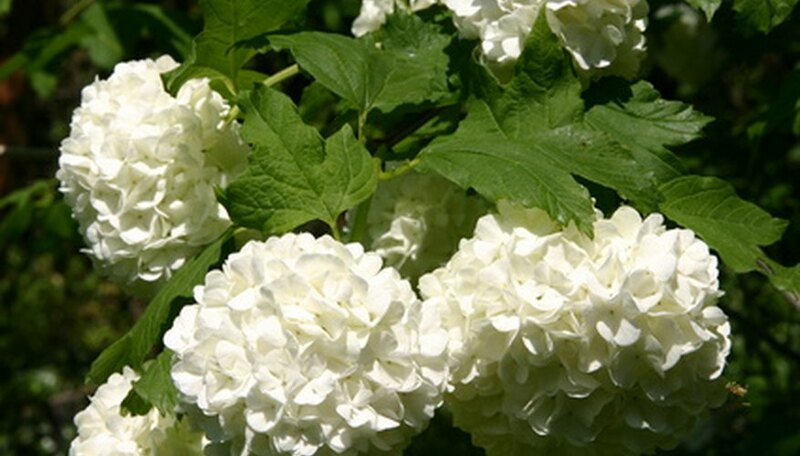 Specifically, the snowball bush resembles the paniculata hydrangea, which grows 10 to 22 feet in height and produces large white blossoms. Snowball bushes will tolerate most soil types and prefer full sun. The syringa vulgaris, or common lilac, produces a similar-shaped shrub with large purple blooms. 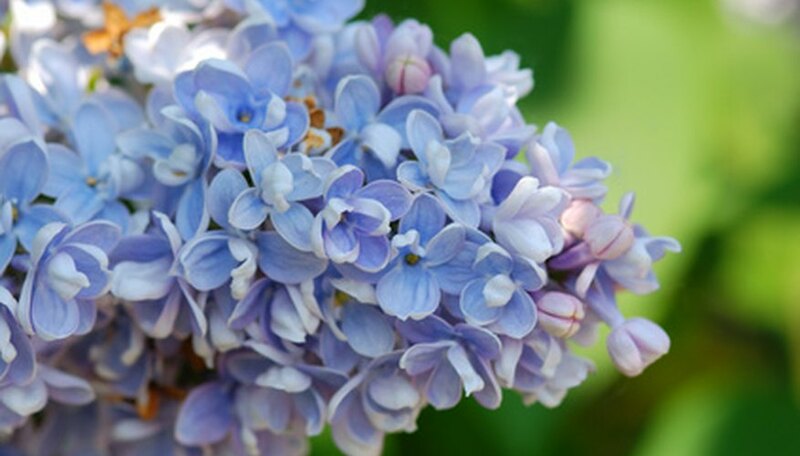 Like the snowball bush and the hydrangea, lilac blossoms are comprised of small clusters of oval-shaped petals. The lilac blossoms are more cone-shaped than the globe shapes of the snowball and hydrangea. According to the United States Department of Agriculture, lilac bushes bloom in late spring and can grow to 20 feet at full maturity. Although the most common lilac bush is a dark purple color, there are two other cultivars, the Katherine Havemeyer, which is a light lavender color, and the Madame Lemoine, which has double white flowers. Lilac bushes prefer well-drained hummus rich soil and full sun. Paeonia suffruticosa, or peony tree, is a perennial that produces large flowers in the spring. The peony blossom consists of a large petal cluster instead of several small clusters such as the hydrangea, lilac and snowball. 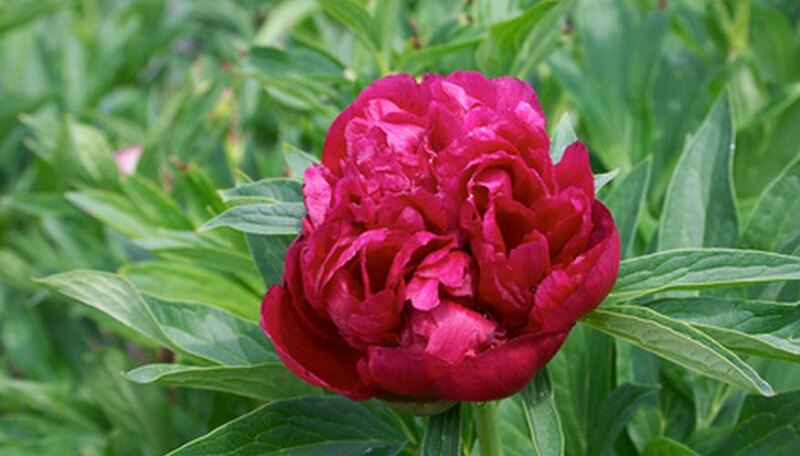 However, the peony is similar in overall size and shape. According to Fine Gardening, an online gardening resource, peonies typically grow 4 to 10 feet tall. Peonies often are appealing because they come in a wide variety of colors, including pink, rose, magenta, red, scarlet, yellow, white and cream. Peonies thrive in well-drained soil and full sun. Butterfly Bush, or Buddleja Davidii, is a fast-growing perennial that comes in a variety of colors and, as the name implies, attracts butterflies. This shrub grows to approximately 10 feet tall and flowers in the summer, according to the American Horticultural Society's "Great Plant Guide." The butterfly bush resembles a hydrangea in that the blossoms are a cluster of small petals, but they generally are lance-shaped as opposed to globe. The butterfly bush will tolerate a wide range of soil types but prefers full sun.